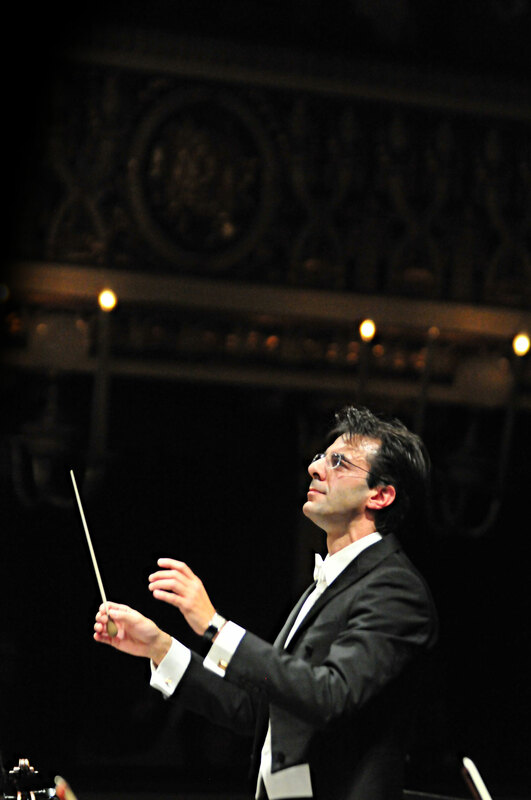 Acclaimed Italian conductor Alessandro Fabrizi led in recent seasons prominent orchestras throughout Europe which earned him high praise by critics and audiences. Since 2019 he is musical director of the Contemporary Musical ensemble, a versatile orchestra of about 60 players, with which he develops innovative cultural-musical projects. In the same year he is co-founder of the MACmusic Group, a multicultural Arts Centre that propose heterogeneous musical ensembles: from chamber music to the symphony orchestra, including also jazz formations. In 2018 he started a recording productions of unpublished works from the baroque to the twentieth century, along with soundtracks of movies and a special dvd to the memory of the victims of the Holocaust. In 2017 he has been awarded with an Honorary Doctorate in Orchestral Conducting and Musicology by the International University of Scientific Research (L.U.I.R.S.) in Rome. In 2016 he starts with an extraordinary collaboration with the Pontificie Musical Chapel – Sistina for world premiere performances involving Pope’s Choir with an orchestra for the first time in its history. In 2015, Maestro Fabrizi was on tour with the London Royal Philharmonic Orchestra to appear at the Dubai World Trade Center under the Patronage of H.H. Sheikh Mohammed Al Maktoum Bin Hamdan, the Crown Prince of Dubai. In 2014, Maestro Fabrizi made his successful debut at the Berliner Philharmonie Hall with the Berliner Symphoniker conducting Tchaikovsky’s Fifth Symphony. He made headlines leading the Royal Philharmonic Orchestra London at Cadogan Hall in November and again in June 2014 for the inauguration of the “Music and Neuroscience” project. Other conducting highlights of 2014 included his appearance with the San Carlo Theatre Orchestra in Naples and with the Orchestra Sinfonica Siciliana. In 2013 he was guest conductor of the Teatre of Como for the Opera Domani Project 2013, performing Wagner’s “Der Fliegende Hollander” at various Italian theatres including Arcimboldi of Milan, Regio of Turin, and Comunale of Bologna. In 2013, his performance of Rossini’s Stabat Mater at the Romanian Athenaeum in Bucharest with the George Enescu Philharmonic Orchestra and Chorus received considerable artistic acclaim. In 2012 Maestro Fabrizi took the podium to conduct Brahms’ First Symphony with the Royal Philharmonic Orchestra in London. In since 2011, his performance of Tchaikovsky’s Fourth Symphony with the Royal Philharmonic Orchestra at Cadogan Hall in March 2011 was enthusiastically received and gained recognition in reviews from the leading UK magazine “Seen and Heard International,” which defined it a “shining and masterful performance. In 2011 Maestro Fabrizi was invited to conduct a Gala-Concert in commemoration of Maria Callas at the National Opera Theatre in Bucharest and he conducted Tosca at the Opera Festival at the Arts Center Opera House of Seoul. In 2010 he inaugurated the season of the “Italian Simphonic Orchestra Monteverdi” with Beethoven’s Ninth Symphony at the Flavio Vespasiano Theatre in Rieti, which earned him high praise from both the public and critics. Maestro Fabrizi has been engaged in projects of cultural innovation. He has worked in cooperation with researchers at UCLA (University California of Los Angeles) and he is a founding member of MEDIARS, an experimental center which is involved in new technologies for culture and performance. He has conducted throughout the world, including Italy, United Kingdom, Germany, Russia, Ukraine, Czech Republic, Romania, Bulgaria, South Korea, Mexico and Japan. He conducted the Royal Philharmonic Orchestra, Berliner Symphoniker Orchestra, San Carlo Theatre’s Orchestra of Naples, the Orchestra Sinfonica Siciliana, the Seoul Philharmonic Orchestra, the George Enescu Philharmonic Orchestra, the Chamber Philharmonic and the State Symphonic Academy Orchestra of San Petersburg, the New Europe Symphony Orchestra, the Youth American Orchestra, the Turingie Philharmonic Orchestra, the Chamber Orchestra of Marche and Umbria, the Black Sea Philharmonic Orchestra, Theatre Sociale’s orchestra of Como, the State Slovack Orchestra, the Italian Symphony Orchestra Monteverdi and La Scala Soloists. He began his conducting career at the side of Maestro Jeffrey Tate with whom he studied many of the classical, romantic and late-romantic symphonic and operas scores, mainly in Italian and German. He collaborates with Mo. Tate also for productions at the San Carlo Real Theatre in Naples, including Mozart’s “The Marriage of Figaro”, Bartok’s “The Barbablu Castle”, and Ravel’s “L’Enfant et les Sortilèges”. Then, he served as assistant of Maestro Donato Renzetti for operas including Tosca at the Verdi Theatre in Trieste (cast with Daniela Dessì, Marco Armiliato and Juan Pons) and Adriana Lecouvreur at the Massimo Theatre in Palermo. In 2007, his rising success was solidified at a concert with the “New Europe Symphony Orchestra” at the Bulgaria Hall of Sofia. This marked the beginning of many collaborations with East Europe Nationals Theatres: a three-year training that allows him to debut a huge opera repertoire, mainly Italian. During this period he conducted Le Nozze di Figaro, Cavalleria Rusticana, Pagliacci e Carmen, Elisir d’Amore, Il Trovatore, Un Ballo in Maschera, La Traviata, Rigoletto, Lucia of Lammermoor, Madame Butterfly and Pagliacci. Together with his concert activities, during the years 2001-2004 he also took on a teaching role in two Italian Conservatoires: “N. Paganini” of Genova and “G. Martucci” of Salerno. In 2010 he has been appointed Ambassador of Peace from the Universal Peace Federation and the Order of Knights of Malta. Alessandro Fabrizi has been reviewed by many newspapers and specialized magazines: Seen and Heard International, Il Messaggero, Il Tempo, Sette Giorni, Il Corriere Adriatico, Newsunday, Italoeuropeo, Amadeus, Aise, Liricamente, La Notizia, Gulf News, The National, etc. Alessandro Fabrizi began his music studies on piano and percussion instruments at the age of five at the Italian Conservatoire “A. Casella” in L’Aquila, graduating in the latter with honors. At the age of 21, he won the International Music Competition of Riviera del Conero (Ancona), from approximately five hundred participants from around the world (Gert Meditz president of the jury). A few years later he won a competition for timpanists held by the Orchestra of San Carlo in Naples, with whom he worked steadily for several years, alternating frequent collaborations with the Orchestra of the Accademia Nazionale di Santa Cecilia in Rome. During this period he also participated in several recordings of soundtracks collaborating with the roman composer Ennio Morricone and with the solistis of the Akademie des Berliner Philharmonisches. As soloist he also performed with the american pianist-composer Chick Corea broadcasting on RAI TV. At the same time, he began his composition studies and orchestra conducting at the high perfection course at the Music Academy of Pescara with M. Donato Renzetti and attending master-classes with M. Kenneth Kiesler (Professor of orchestra conducting at the University of Michigan in the United States) and Jorma Panula (Professor at the Sibelius Academy in Finland). In 2008 he was among the eight finalists selected around the world for the master-class competition in St. Petersburg, of the St. Petersburg Chamber Philharmonic Orchestra (President Gennady Rozhdestvensky).